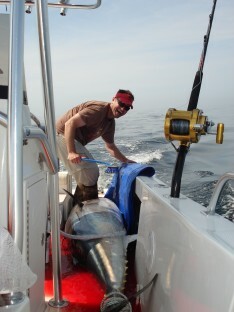 Free Fishing Reports > Northeast > Maine > York > Mackerel, Stripers and Tuna, Oh My! Mackerel, Stripers and Tuna, Oh My! June ended with a bang this year. We’ve had a phenomenal Bluefin tuna bite recently and Striper fishing remains good. Some days we are working harder for bait than others. We will be gearing up for sharks really quick.Flounder season just opened and numbers have been good. I even got the chance to go spear fishing for some. Visiting the Southern Maine Coast? 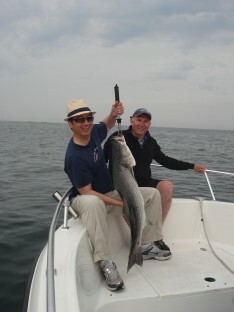 Enjoy a relaxing Saltwater Fishing Charter with Captain Greg Brown and G Cove Charters in beautiful York Harbor, Maine. Enjoy a great day on the water fishing for Striper, Bluefish, Mackerel or Sharks. Fishing Charters are available June through October, weather permitting. Free daily reports posted by charter captains, party boats. tackle shops, and other professional fishermen. The reports are moderated and verified by us. You can get reports by twitter by visiting our TWITTER page or FACEBOOK page and selecting which states to follow. Clayton Bangs his Trophy Tog! Father and Son In Law Hit the Tog Hard! “Team Howell” out for a day of slamming the Blackfish! Absolute Slayfest on the Tog! September Bass bite Never Ends! Team Bene Had a nice Bass bite in Adverse Conditions! Don and the Mailman once again Deliver! Junior gets into the Bass making Sept. a banner month!